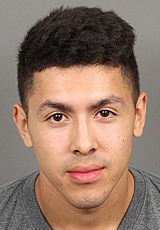 LA QUINTA, CALIF. – 10/09/2015 — According to Riverside County Sheriff’s Dept. Sgt. Paul Heredia on Saturday, October 3, 2015, at 3:41 A.M., the La Quinta Police Department responded to a traffic collision at Washington Street and Sagebrush Avenue in the city of La Quinta. A 1996, Acura TL was traveling southbound on Washington Street when the driver lost control of the vehicle and collided with the center median before striking an irrigation box. The driver was determined to be Javier Quintanilla Flores, age 21 of La Quinta. The driver was uninjured. Charges will be filed on Flores for driving under the influence of alcohol. The investigation is ongoing and anyone with information about this incident is urged to contact La Quinta Police Department at 760-863-8990 or anonymously through Crime Stoppers at 760-341-STOP (7867). The La Quinta Police Department urges all drivers not to drink and drive. To report suspected drunk drivers, please call 911. This entry was posted in DWI news articles and tagged irrigation box., Javier Quintanilla Flores, La Quinta Police Department, Riverside County Sheriff's Dept. Sgt. Paul Heredia. Bookmark the permalink.